My daughter will be 8 years old in January and has been a fan of Pinkalicious since she was 5. She fell in love with the books during her Kindergarten year, now in 2nd grade they are still among her favorites. 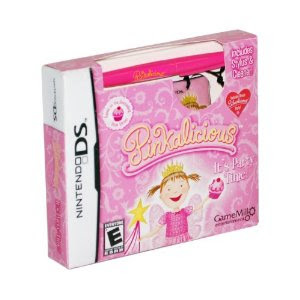 In Pinkalicious, It's Party Time, your little princess is able to interact with Pinkalicious and explore the magical town of Pinkville. The most popular hot spots are the Bakery, Florist and Ice Cream Parlor! Ice cream, pink lemonade, chocolate, cookies, flowers... who wouldn't love an adventure like this? After playing this game for what seemed like hours, my daughter told me that she wants to be a baker and a princess when she grows up! Pinkalicious celebrates all things pink! Pinkalicious loves her friends, family, and fun and what better way to combine them than a pinktastic party! 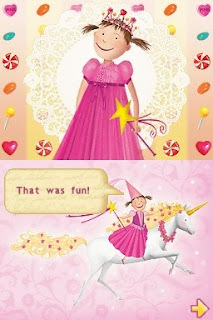 Players express their licious style by designing parties, choosing invitations and decorations, creating cupcakes and other delicacies, and ultimately staging a party experience for Pinkalicious and her friends. Join Pinkalicious and her friends in Pinkville to help plan some of her favorite parties! Make cookies, cupcakes, lollipops, lemonade, and more! 17 different characters from the Pinkalicious series of books! Customize all of the characters in the game to look like you and your friends! 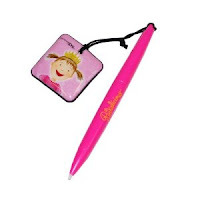 The Pinkalicious Nintendo DS game includes Stylus and Cleaner!